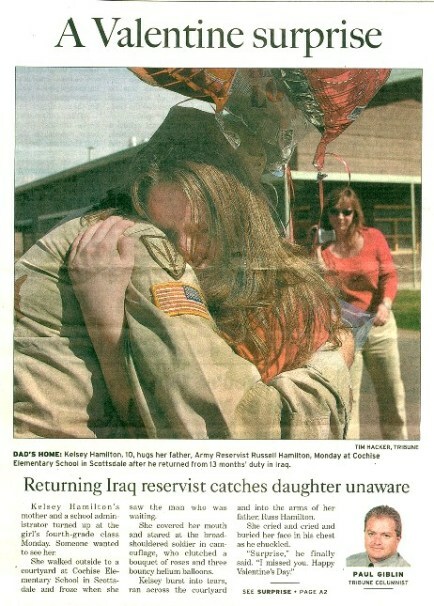 Regarding Military Reunions, this is a very personal reunion that touched all of us at Research Etc., Inc. In 2005, Russ Hamilton, husband of our president, Kristen, returned from a 15 month tour of duty in Iraq on Valentine's Day. His arrival date was kept a secret from their 10-year-old daughter, and the school made arrangements to call her to the office during class, having her father standing outside in the courtyard to surprise her. The teachers and kids all came out to watch, and the local newspaper was there and covered the event, with not a dry eye anywhere. 17 Apr 2006 WWII Paratroopers, 511th Airborne Prepare for Reunion!